Review In A Nutshell: The topic of This Is Where It Ends, and general plot, is really important, and I think it’s really important for people to try to understand more so that we as a society can figure out how to put an end to it. As just a book, it was okay, but when you add the importance of the message, this book becomes something great. This Is Where It Ends takes place over 54 minutes, in a small high school, as a lone shooter traps the student body and starts to kill. The plot is gripping, showing a situation that is unfortunately familiar to many people who follow the news in America. The pace is fast, filling you with fear and dread as you wait to see what will happen and how the characters will get out of this terrifying situation. While the majority of the book takes place during these traumatizing moments, there are frequent flashbacks from the various protagonists’ points of view, showing what led up to this tragedy. It’s brutal, scary, and an overall good read. This book takes place in a small town, and it seems to not be the most open-minded place to live. The setting is fairly straightforward, as in most contemporaries, there isn’t much to describe here. The writing is also simple, nothing too elegant or overly descriptive. But it works in this book. It keeps the focus on the most important aspects: the characters and the plot. This book has a very diverse cast of characters, something I loved. There was a lot of representation, with various different races and sexualities. It felt like a real high school, where the people are all different and individual. While the main cast is large, it makes sense for this book. Sometimes I found it hard to keep track of which character is doing what and how they know who, but it wasn’t that bad of a problem while reading. The many characters were all important in their own way, and realistically no one of them alone could do anything that would have made a huge difference in the situation they were in. I also loved how scared the characters were. They were genuinely afraid like any high schooler would be if this happened to them. While they were trying to be brave, and save their loved ones, they also weren’t trying to be heroes. They knew they were outgunned, and they were understandably terrified. How they handled everything felt real and honest, this book wasn’t trying to make one person the hero who saves everyone. I saw a lot of people complaining that the villain was pretty black and white evil. And I do understand why they would think that, I think there’s more to it than what people are talking about. He does show some depth, and there is a little bit of an explanation showing some of the warning signs he exhibited and what made him this way. He didn’t just wake up and decide to be evil and kill his ex-classmates, it’s clear it was a premeditated attack. You see what made him how he is and his motivations for what he’s doing. Some people said he’s too evil to be realistic, but there are people out there like this. Now, when people say that they wanted more about his backstory and what lead up to the events of the book, I understand. But I think it’s good that there wasn’t an emphasis on him. This book isn’t about the shooter. It’s about the victims. It’s about the community. It’s about those who were affected and how tragedies like this can ruin someone’s life, and how it ends so many. And I think people should focus on that more in real life as well. 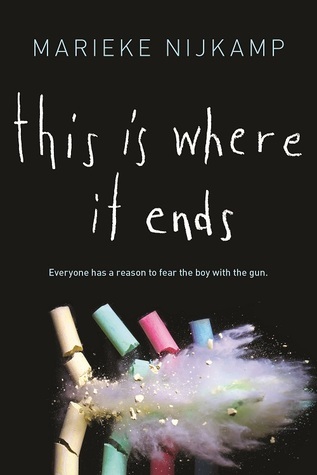 This Is Where It Ends is important for people to read and understand. While it isn’t the best book ever written, it is topical, and something people should strive to better understand.